I live in Perth, western Australia, and this Sunday morning on the radio I was listening to the BBC overseas broadcasts, when the topic of Solar power was being highlighted. I heard your name, and have since gone to various web sites linking you. I am a "Senior Citizen", and although without any technical schooling or background, I have been wondering for many years why Solar Power has not replaced fossil fuel. I now, understand that it has been too expensive in the past, and that mining companies have been only too pleased to dig up coal, drill for oil, and "uncork" the underground and undersea gas reserves. 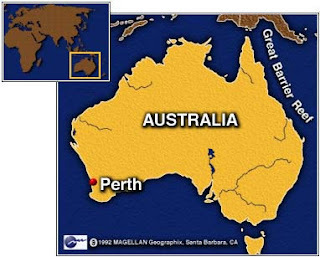 Perth has in the last two weeks, been made aware that an off sea gas drilling company..."Apache" rig.... had a recent flame out or explosion, causing the rig to cease operations. This has led to ONE THIRD of Perth's gas supply being closed. Repair to the rig, may take many many months, highlighting the sad reality of what can happen to industry and households. Today's newspapers, and some politicians comments have told us that, some factories, mining companies, brewing companies, steel companies, may have to temporarily reduce staff and output. Hospitals and hotels have been advised to reduced their laundry as much as possible, in an attempt to preserve what gas is available from other outlets. Home owners have been encouraged to "turn off" lights and electric equipment when not being used, to reduce the demand on electricity from steam turbines heated from gas. This is the Twenty First century, and it really is quite laughable, when all the technology that has evolved in the minds of mankind in the last one hundred years, leads us to cutting down on laundry, and turning the gas heater down. This continent is the sunniest continent in the world. Blazing sun and dry open desert, lost in a flat landscape, ideal for solar power; and one off shore gas rig shuts down, leaving us an embarrassment. Even our sea water vaporisation unit, designed to help provide a flow of useable water,(* which due to too many very dry years has cause reservoirs to dry out ) has been told to shut down to lessen the demand on power. ......Thankfully its winter and we are getting rain, and not subject to another drought. I notice in one of the web sites liked to you, suggested you have stated that CSP plants have been constructed in Spain, Australia and California. Can you give me more information on where in Australia, and those involved in the construction and planning? Oh, and as a P.S. one of our smelly black coal fired power stations, previously "mothballed" has been given the green light to start up again. Now is that progress. Our State Premier Mr. Alan Carpenter, and his Energy Minister Mr. Fran. Logan, could probably....no....most probably, benefit from a communication from you and your foresight. This is a great state in a great country, but its sad that today we are using nineteenth century resources to drive the machinery of the twenty first. Hopefully the world will appreciate one day, people who like you, try to open the eyes of those who are not prepared to look.